Second or third floor bathrooms are great, but if there is a leak in the shower, it’s hard to know where to start! There are many possible places that a tub or shower can leak water. If you have a leaking shower, then don’t proceed with your repairs until you know these ways to diagnose common problems. 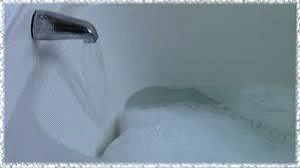 Test to see if the problem occurs when just the shower runs or does it also appear when water runs from the tub spout (if you just have a shower without a tub, then you will need to modify these procedures slightly). Run lots of water out of the tub spout and monitor the wet area. You may have to let it dry up before you can really see if new water is appearing. 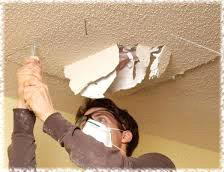 If the leak is on a drywall ceiling below, then consider cutting a small inspection hole to help evaluate your test results. If you still find water below, then proceed to step #2. If you see no water from this test, then that means that the leak is either in the riser pipe that runs from the valve to the shower head inside the wall OR from water that is splashing inside the shower and finding a way through the surfaces in the shower. To further narrow down these two options to one, examine the water flow carefully while the shower is running. Does it clearly spray out of the shower head or is there water streaming back to the wall? If water is running against one of the walls, then correct the problem. If you don’t think this is the case then have a helper hold a large bucket under the shower-head while testing again. Run the shower this way for 2 or 3 minutes (or for longer if it normally takes longer for the leak to show up) dumping the bucket in the toilet or sink, as needed. Most likely this will prove to keep the leak from showing up because leaks in the pipe behind the wall are very uncommon. 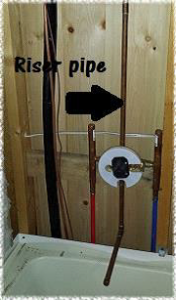 If your leak has been kept away by this, then the problem is not inside the wall. You most likely have a problem with a seal in the surfaces of your shower. Caulking and sealing are in order. If, after the bucket test, you’re still getting leaking water below, then you most likely have a problem with the plumbing inside the wall. Find a place to get access and cut a work hole to make the repair. If either of these two results has revealed the problem. No need to go to step two. Just get to work! Next let’s do another test. Stop the drain and fill your bathtub with water. Make sure that the drain is holding water and not seeping through. 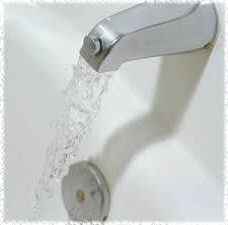 You can usually hear the water seeping if you turn off the water and listen carefully. Let the water stand in the tub for several hours and see if the leak is present. If so, then the problem is on the top side of the tub where the drain assembly is supposed to seal to the tub. The solution is to unscrew the drain assembly and reseal it with plumbers putty (or clear silicone if you have a cultured marble tub). You have found your problem! If your test results in no water, until you un-stop the drain that is, then you can proceed to step #3! Now let’s look further down. We have isolated the problem to below the tub surface. In the image above you will see the bath drain shoe. On the bottom of the tub is a thick rubber seal that is pulled tightly up against the bottom of the tub by the drain shoe to keep water that goes down the drain from leaving the constraints of the pipe. This is your next most likely spot to have a problem. This seal can dry up and crack over time and lose its ability to seal. This can be replaced from the top by removing the drain assembly and slipping a new one through the drain hole and resting it under the tub. Reinstall the drain assembly with plumber’s putty or clear silicone. 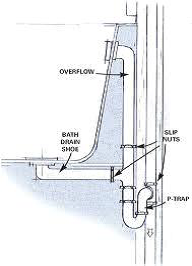 In cases where the bottom of the tub is visible, simply look at the connections on all the pipes while water is running through them and determine where the leak is. It’s not so easy when the ceiling below hides all this from your view. In many cases the best way to diagnose and repair it at this point is to cut out a work hole below and patch it after the repair is complete. If you pass all these tests and still have a leak when the water is running, then you probably have a damaged place in a pipe. 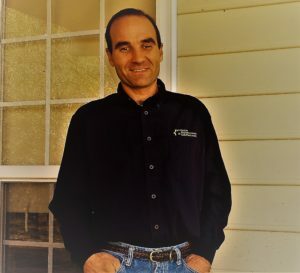 At this point you can start cutting into the ceiling or walls to find the leak knowing that you did everything you could to eliminate the simpler solutions. Always be careful when cutting into a wall. Proceed slowly with a hand saw to avoid damaging a pipe or wire. It can cause serious injury, if proper care is not taken. Test to see if the problem occurs when just the shower runs. Next let’s do another test. Stop the drain and fill your bathtub with water. Now let’s look further down. The bottom seal can dry up and crack over time and lose its ability to seal under the tub. I hope that this helps you when diagnosing a drain leak in your tub or shower.